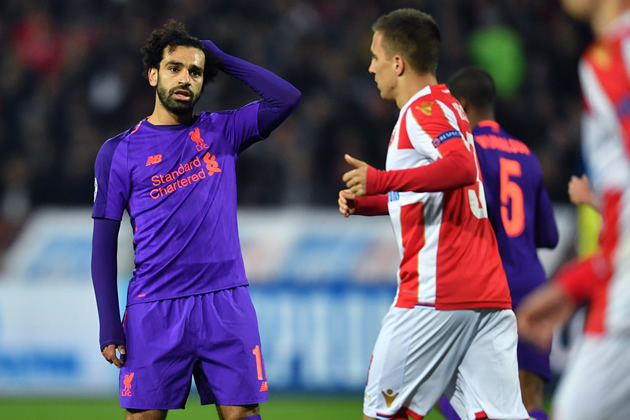 Liverpool face the threat of crashing out at the Champions League group stage after a shock 2-0 defeat to Red Star Belgrade in the Serbian capital on Tuesday. Milan Pavkov scored twice in seven first-half minutes to hand Red Star their first Champions League victory in 26 years. Last season’s Champions League finalists paid for a sloppy start and Jurgen Klopp’s decision to make three changes from the side that started a 1-1 draw at Arsenal on Saturday. Red Star had conceded 10 goals in being thrashed by PSG and Liverpool in their last two European encounters. Liverpool are still unbeaten 11 games into the Premier League season, but have now lost their last four Champions League games away from Anfield.